Police say the driver suspected of causing a high-speed, multi-vehicle accident in Federal Way on Monday has a previous DUI conviction on his record and could be facing additional criminal charges for his role in his latest brush with the law. 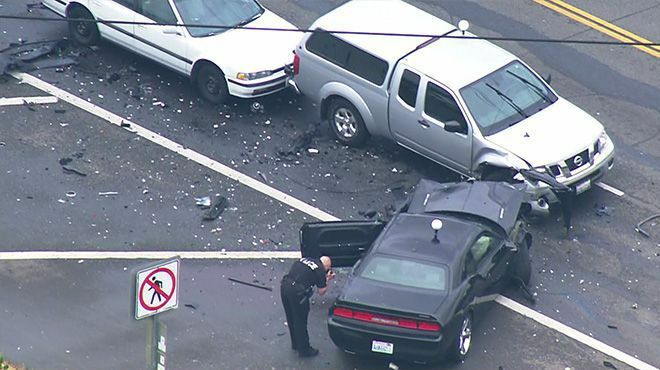 According to KOMO News, 42-year-old Justin Ozburn was driving his black Dodge Challenger at extremely high speeds through Federal Way just before 11:30 a.m. Monday when he crashed into four different cars on South 320th Street near the Interstate 5 onramp. Federal Way police officer Cathy Schrock says a 48-year-old woman from Tacoma suffered internal injuries as a result of the crash. She was listed in critical condition at Harborview Medical Center in Seattle, according to Schrock. Another driver, identified as a 35-year-old woman from Auburn, suffered head, neck, and internal injuries and is also listed in critical condition at Harborview. Investigators believe Ozburn was driving westbound on South 320th Street at a dangerously high rate of speed when he crossed the centerline into the eastbound lanes of traffic. Ozburn also suffered serious injuries in the crash, and he was taken to a hospital for treatment. Schrock said that he is considered to be in police custody for his role in causing the drunk driving accident while receiving treatment at the hospital. The fact that Ozburn is considered to be in police custody while he receives treatment for his injuries suggests that police already have enough evidence to press criminal charges against him for his role in Monday’s accident. According to Schrock, police will likely recommend vehicular assault charges against the man, and that the results of a toxicology report could lead them to pursue DUI charges as well. Ozburn has a prior DUI conviction on his record from 2006 in Texas, according to KOMO. If he does end up facing DUI charges, the fact that he would be considered a repeat offender could potentially result in him facing stiffer penalties and fines. As for the victims of this tragic accident, it would likely be in their best interests to consult with an experienced car accident lawyer in order to determine their legal options for recovery. Understanding the complexities of an investigation like this, in addition to determining whether or not the at-fault driver was carrying enough insurance to compensate the victims, will be important factors in deciding whether or not to pursue a personal injury claim.